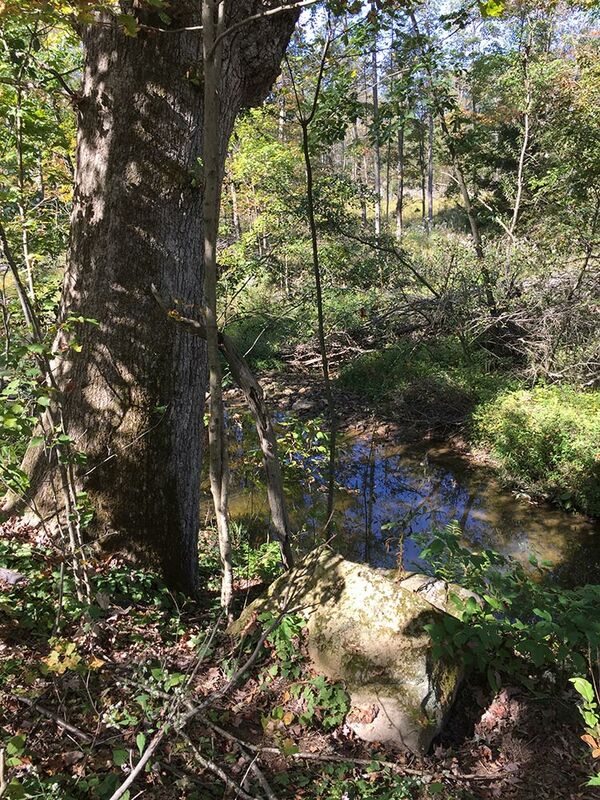 To follow up from two posts a month or so ago on ecoregional druidry and the wheel of the year and celebrating rituals, observances, and activities, I want to continue thinking about how druids can adapt basic practices of druidry to their local ecosystems. This is particularly important for those of us in diverse ecosystems around the world: part of nature spirituality is being with nature as she is in your region. Thus far in this series, we’ve explored a druid’s wheel of the year that is seasonally-focused on a local ecosystem as well as the different ways we might celebrate this wheel of the year with rituals, observances, and activities. Also tied to these spiritual practices are symbolism associated with the elements and directions; framing symbolism that weaves its way into our practices in a variety of different contexts. And so, in this post, we’ll delve into thinking about basic symbolism we use in the druid tradition and how we might adapt that based on an ecoregional approach. What is symbolism? What does it do for us? Before I get into why we might adapt symbolism and reasons to do so, I want to talk about what symbolism is in its basic form. Catherine Bell, who did some of the most important scholarly work surrounding ritual in the 20th century, suggested that ritual practices connect people to archtypical or universal acts, attitudes, structures, or functions. Symbols, within ritual, work like “a language for the primary purpose of communication” (61); in other words, symbols convey meaning to people who use them, and that meaning should be tied to the broader context. The challenge, of course, comes in balancing individual needs and practices with those of the broader community. This is a choice that each of us have to make–by moving further away from the traditional symbolism, it may be harder to align with larger community values. If you are a solo practitioner, this may not be an issue for you. But if you plan on running a grove or attending gatherings, it certainly may be. Finding ways of developing a shared vision of what your ecoregional druidry looks like is in part, a negotiation with any others you might be practicing with. You might also choose to expand the four directions to eight, but they don’t typically include animals. Recently, at the OBOD East Coast Gathering, the Mystic River Grove added other animals: moose, skunk, turkey vulture, and turtle. The traditional associations of the directions are used in all sorts of ritualized ways (both in OBOD and AODA) including in opening rituals and protective workings. Because they are so pervasive and such an important part of the tradition, I personally believe that resonating deeply with these symbols is critical. So let’s take a look at how we might adapt any one of these symbols and what is gained–and lost–from doing so. We’ll also explore adding in new symbolism or alternative symbolism. In the druid tradition, adaptation of the basic symbolism to your local ecoregion is not only common, it is encouraged. Part of living with the land is drawing upon the animals, plants, and energies present immediately in that land that speak to you. Beautiful Rooster can hold the east! Elements and directions. 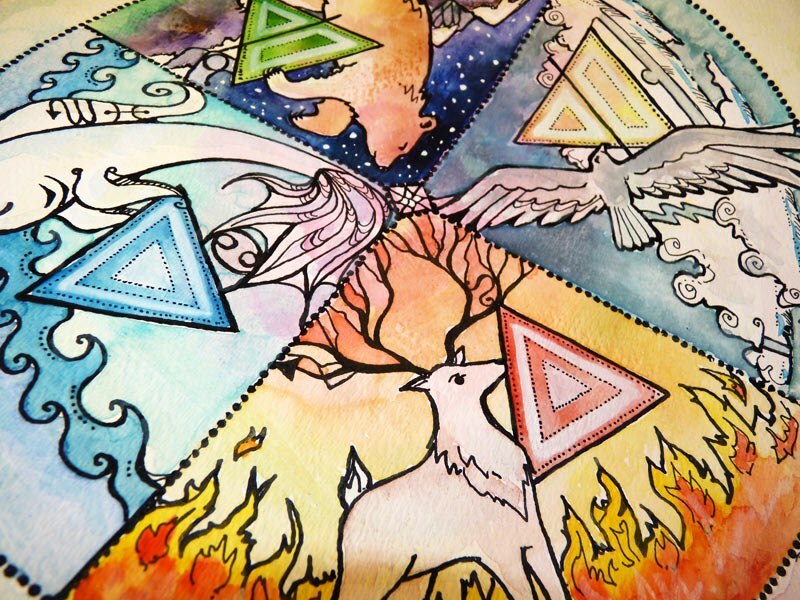 The elements and their directions are specific to the druid path and other Western Esoteric circles. These associations are widely used by many, and in groups, give people some cohesion and consistency. Generally, I think these associations aren’t worth changing in most circumstances, especially if you are planning on working with others, but there is one instance that comes to mind where you might change them. This comes when you have a powerful elemental force in a different location such as a huge body of water in the east, a mountain in the south, and so on. I have found it is helpful to “feel out” where the strongest force of the element is and use that if you feel that strong pull or are particularly sensitive to it. When I moved to the Great Lakes Region, for example, water was all around me, but I would often accidentally call water in the East because Lake Huron was closest to me and I was connected with the Lady of the Lake. Eventually, I solved the problem by connecting to a lake that was much closer to me (and much smaller) in the west so that I could keep my traditional associations (which I really wanted to do). Animals. Druids in diverse ecosystems may find that the traditional animals may need to be reconsidered. This is for any number of reasons: perhaps the animals are not found in the ecosystem, perhaps the druid has no connection with the traditional animals, or perhaps the druid doesn’t have a good connection with that animal. Some choose to use the traditional animal symbols from the druid revival as well as their own additions in the cross quarters (or may have several sets of symbols depending on the location). Again, careful observation of nature, combined with looking for animal signs and seeing what speaks to you, is a useful practice. In my case, even though three of the four animals are present in my ecosystem (hawk, bear, stag), I have substituted the salmon for a rainbow trout, painted turtle, or river otter. 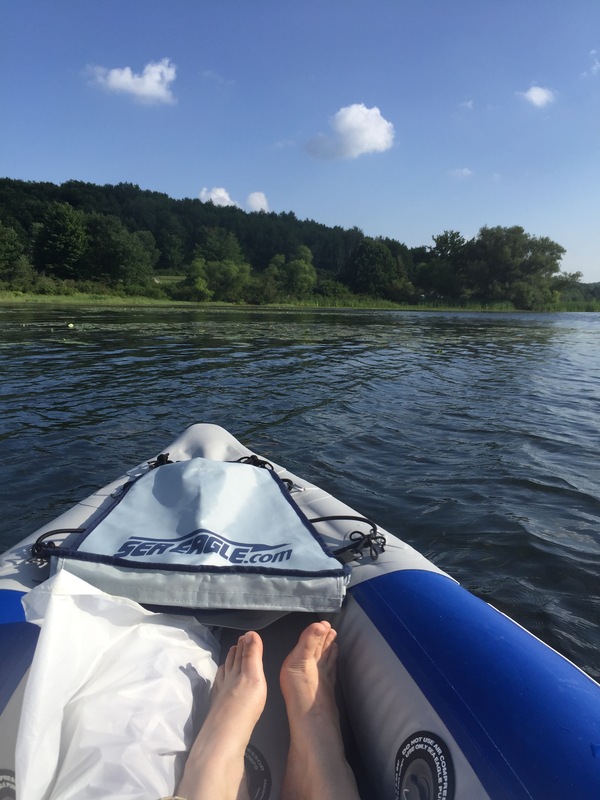 The river otter is a particularly powerful symbol for me here in Western PA because otter was lost to our rivers and only in the last two decades has been reintroduced and is making a comeback–and as a kayaker, I see them regularly on my trips. This is a powerful symbol of regeneration that I have experienced firsthand and is something I want to draw upon. When I was in Michigan, I had painted turtles and snapping turtles on my property near the sacred space, so they were what I called in the west. On my land in Michigan, I did have hawks, but I didn’t want them too close (as the hawk would come eat my chickens regularly). 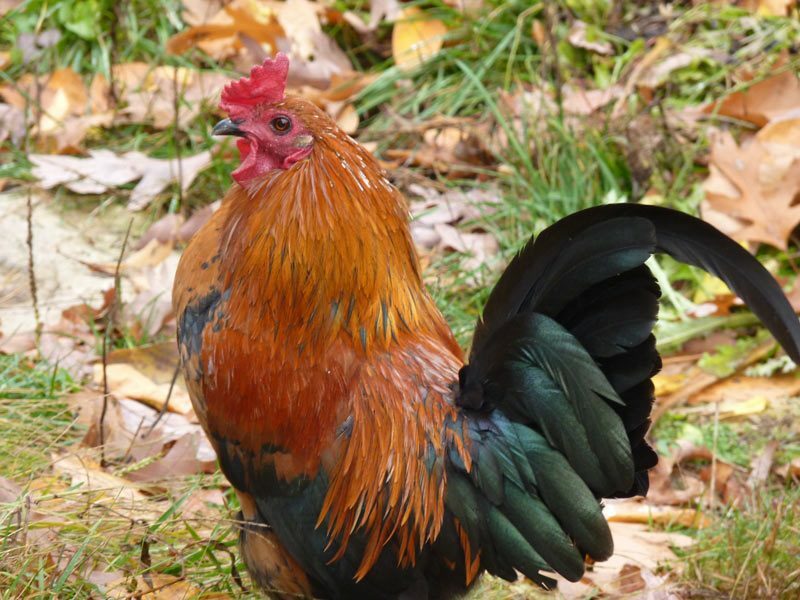 So rather than calling in that energy, I called the energy of the “Rooster crowing up the sun” in the east, the energy directly on my property. I would also sometimes call the Raccoon in the north, since the Bears were so rare in that area as it was more heavily populated. This felt right and powerful; I was honoring the animals that were immediately present in my ecosystem (and trying to keep away predators that would do my flock harm). Spend time in the land around you and see what animals resonate with your own path. Another place you might go for symbolism, rituals, activities, and observances is your own family history or regional history. Look to the folk traditions, find the magic inherent in the landscape, and use that as your symbols, words, phrases, things that resonate. Often, small bits of older traditions (folklore, folk songs, even magical traditions) leave echoes upon the landscape and cultural history, tucked away in old bookstores or even within your own family lore. These powerful symbols may find their way to you unexpectedly and be useful as you are thinking about building your own unique path. For me, a barn-sign tradition was a delightful surprise that offered symbolism that resonates both outward upon my landscape but also in my practice. This is now part of my own druid path, as are some of my grandparents’ Pennsylvania Dutch folk magic traditions, like using the Wooly Bear caterpillar to determine the severity and length of winter. 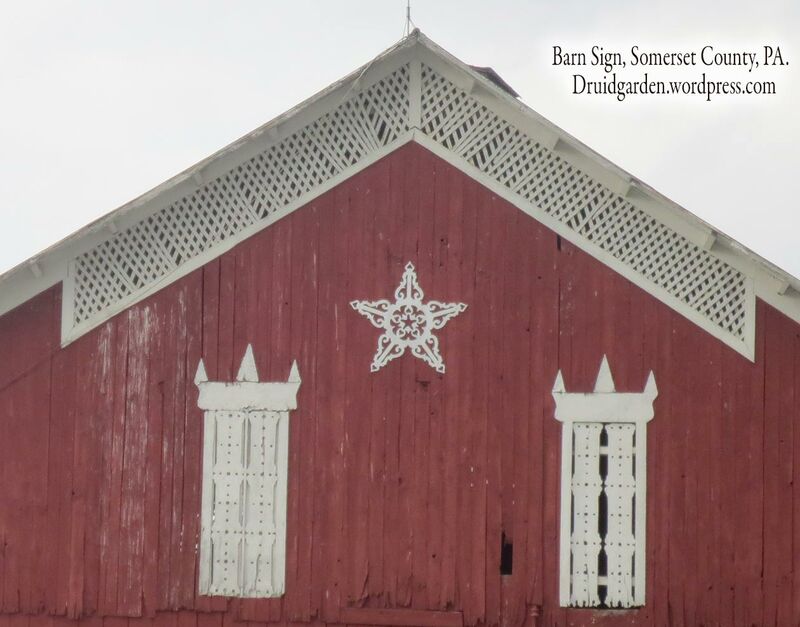 In terms of the Barn Signs, after returning to Western PA, a friend and I were taking a drive through the country when I paid closer attention to the decorations on the barns in Somerset, Bedford, and Cambria counties in PA. Many of these barns were over a century old (one had a date of 1889 on it) and featured certain designs. 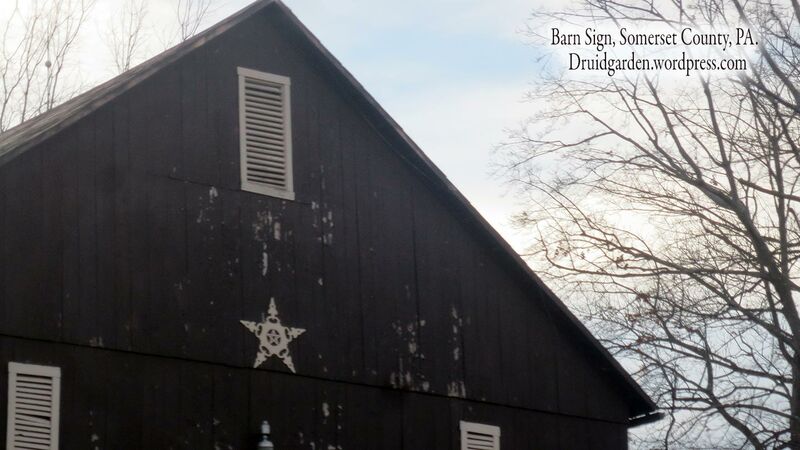 Out in Eastern PA, they have a different kind of magical barn sign, a more widely known “hex signs” and they are colorful with symmetrical images and pictures painted on a round circle. But in Western PA, the tradition seems to be very different: a (usually) red barn with a white symbol that is cut out and applied to the barn. One of the most amazing had two decorative pentacles surrounded by a pentagram: very clearly a magical sign. I’ve worked some of these, as well as the “country” tradition of using the pentacle everywhere on houses, as one of my primary protective symbols. You don’t need to stick just with animals or directions for symbolism that you can use to tie to your druid practice. For example, other symbolism tied to the four (or seven) directions might also be useful for you to consider. These might be songs, movements, hand signals, sacred mountains, images, four sacred places, pretty much anything you want that resonates with you. The possibilities for adapting to your local symbolism are endless–it is a joyful process that will put you more in touch with the living earth. I hope that this post has given you some ideas of how you might further adapt your own druid practices to your ecosystem. I’d love to hear more from you about how you may have done or are thinking about doing of this adaptation work! A group of people make music and merriment near a roaring fire during the longest night of the year. Their mission: to await the sunrise and hold vigil through the darkness with feasting, celebration, and the burning of the sacred yule log. The winter solstice vigil–lasting upwards of 15 hours in the darkness can be one of the most intensive, challenging, and rewarding experiences. I’ve succeeded at one all-night vigil and failed at one all-night vigil (due to underpreparedness, see later in the post) and yet both have been moving experiences. This year, on the 21st, a group of us is going to attempt an outdoor all night vigil. At this point, the weather looks good (not dipping below 30 degrees and clear) which is about the best Winter Solstice Vigil weather you can ask for! In preparation for next week’s vigil, I thought I’d take the opportunity today to reflect on the art of preparing for vigil, doing the vigil, and offering some contextualization for this kind of initiatory work. For one, I’m going to do vigil with some folks who haven’t done it before (and I started writing this for them and realized how useful it would be for others). Its a good idea to know what you are really in for with the Winter Solstice Vigil! But for two, I think its good information for anyone wanting to attempt such a vigil. I’ll cover the history of such a vigil, how to prepare physically and spiritually, what to do during your vigil, and offer simple rituals for both the setting and rising sun. While this post is primarily focused on outdoor vigils, I’ll also include some tidbits about alterations if you aren’t able to be outside for the all night vigil. The term “vigil” itself gives us some understanding of the nature of this work. The term vigil derives from Latin vigilia, which means “wakefulness.” When we look at a few dictionary definitions of “vigil” we get the following kinds of phrases: “a devotional watching, or keeping awake, during the customary hours of sleep“; “a purposeful wakefulness”; or “a period of keeping awake during the time usually spent asleep, especially to keep watch or pray.” All of these definitions offer us useful understanding and insight into the nature of a vigil and why one would take it on. The Winter Solstice vigil is certainly a vigil–not usually so much of a solemn one, but one of wakefulness, watching, and sacredness where we work to tend our fires and eventually, welcome the sun back over the land. Ceremony at the Winter Solstice reaches back, in some parts of the world, to pre-history. The basic premise is simple: before the days of modern electric lighting, humans lived more closely with the seasons. The days of darkness, where the earth seemed to stand still, needed humans’ help to bring the light back into the world. And so, much of the celebrations and feasting at the time was focused on light and life. For example, Sí an Bhrú (New Grange), is a neolithic monument in Ireland that is at least 5,000 years old. New Grange is a large, circular earth chamber with a long stone entrance that is illuminated with the rays of the sunrise on the Winter Solstice. In other parts of the world, especially throughout Europe, the Winter Solstice was often celebrated with feasting and bonfires. Saturnalia, an ancient Roman festival of feasting, gift giving, and revelry in honor of Saturn, was originally on Dec 17th, but later expanded to Dec 17th – Dec 23rd. Many Celtic peoples celebrated the “birth of the sun” or the “return of the sun” around the Solstice (and it is no surprise that evergreen boughs were used to celebrate these events, given evergreen’s connection to life and longevity). A yule log was burned, sometimes with feasting lasting days or weeks. With the rise of Christianity in the 4th century, the Catholic Church proclaimed that the “Birth of Christ” was on Dec 25th to tie to older feasting and merriment traditions. So even today’s modern celebrations of “Christmas” hearken back to much older Winter Solstice traditions. Even today, we have houses lit up with lights, evergreen trees surrounded with lights and colorfully wrapped packages–all magical ways of raising up the sun. All of this background is useful when thinking about the framing of a druid winter solstice ritual and vigil. The mood is not solemn here, although solemn work and initiatory work can certainly happen. Rather, this is a patient wait–through celebration and feasting–for the rising of the Solstice sun. Let’s now turn to some practical considerations before undertaking such a vigil. Preparing for a winter solstice vigil requires both inner and outer preparation, which I’ll now describe. Without both considerations, an all-night vigil can be dangerous and/or unsuccessful. Such was the result of my first attempt at a winter solstice vigil. This was very early in my druid path, and I had really no idea what I was doing. I went to my sacred circle with my hat, gloves, and coat; a big pile of wood; a blanket; a tarp; and a thermos of hot tea; thinking that I would last the night and wait for the rising of the sun. For one, I had no idea how long this night was, nor how hard it was to hold vigil on my own. I quickly ran out of tea and wood, and a dwindling fire was not enough to keep the darkness and cold at bay. 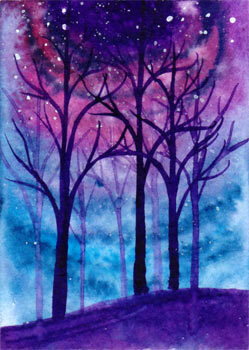 Sometime deep in the quiet night, I grew too cold and the fire grew too dim and I and went back inside to my warm bed. Better physical preparation could have substantially made this first attempt at a vigil more comfortable! The general rule of thumb for these kinds of vigils is to over-prepare. That is, bring more warm clothes than you need, more food than you need, and more of any other supplies (like wood) than you think you’ll need. Outer preparation: Common sense. The weather can be very variable in December and I ask that you please use common sense. A night when it is 35 and the sky is dumping freezing rain down on you is a good way to get hypothermia, not enjoy a winter solstice vigil. Tend to the weather carefully and only attempt this if you are sure you will be safe, warm, and dry. This is my take on it–some years are not good for vigil. I’ll still celebrate, but maybe I’ll light a candle in my window, or hold vigil in my house by the fire. There are other ways of celebrating this–and what I offer here is one of many approaches. Outer Preparation: Clothing. If you have never spent a cold night outside before, you may not realize how difficult it is to stay in a single place and hold vigil when it is less than 30 degrees Fahrenheit (which is fairly common for the places I’ve lived). What this means, for you, realistically are several things: first, you need a lot of warm clothing, preferably of natural fibers like wool or fur. Second, you need to make sure you stay covered throughout the night, including the part of you that is not going to be near the fire (read, extra wool blankets). Bring more than you think you will need, including a warm sleeping bag. All of these things can help you get through the cold night. Having another warm body (a dog, a snuggle partner) is also very helpful. Outer Preparation: A Good Fire. 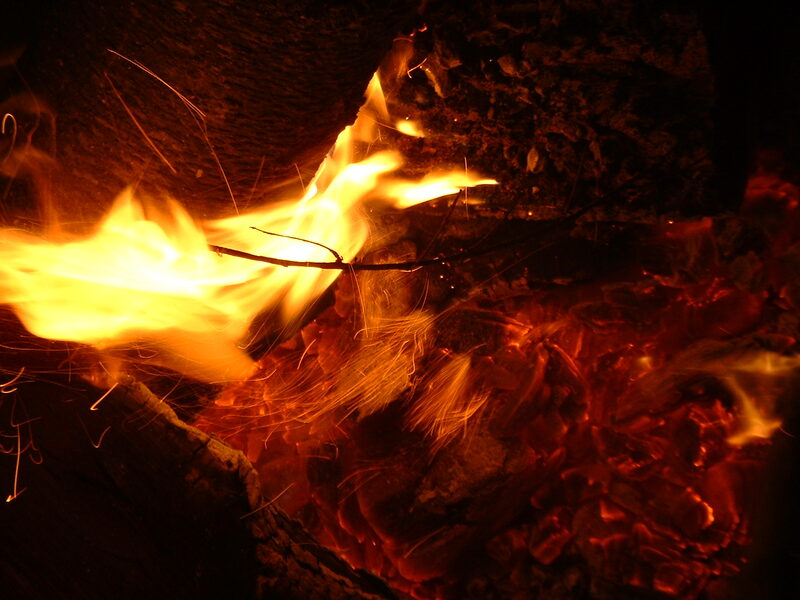 There are a lot of ways of making fire, and making a blazing bonfire is not, actually, a good way to stay warm throughout the night. Big fires require a lot of wood, and a 14 or more hour fire will consume huge amounts of it, blasting heat in all directions. If there are enough folks to go the whole way around the fire, this is OK. But more commonly, there aren’t that many people willing to stay up all night in the darkness! If there are only a few of you, the better approach is to use bricks or stones and build up a reflective surface, then building the fire against that surface (see photo above). The photo shows is a simple fire setup that is small but that will reflect much more heat due to the fire bricks piled up behind. This would also stay lit in the rain and snow for much longer. If I had had this kind of setup during my first vigil, I likely would have made it longer into the night! Outer Preparation: Hot Rocks: One of the strategies I learned about holding vigil has to do with hot rocks or hot bricks. The strategy is simple: have some old towels and stones or bricks available. I especially like a large flat stone that I can sit on. 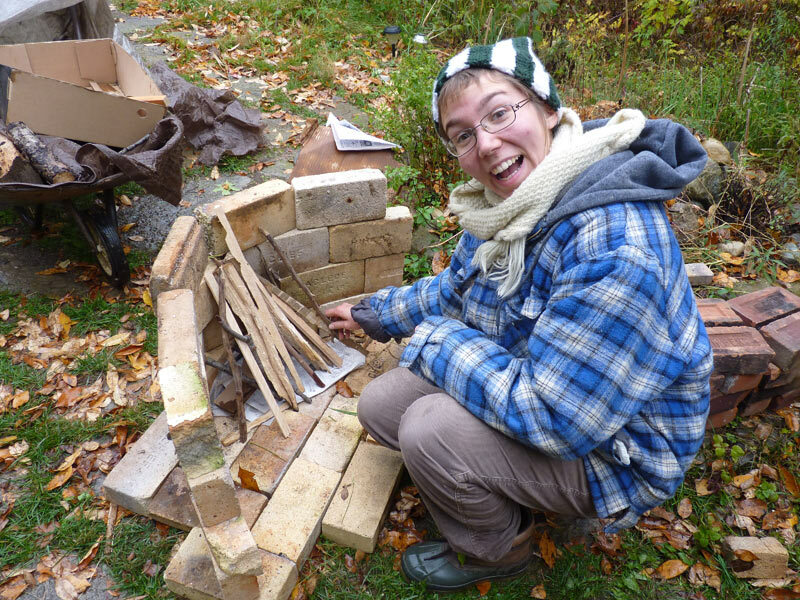 Putting the bricks/stones close to the fire to warm them, then wrapping them with a towel and sitting with them, really helps keep the cold at bay. A largish one makes an amazing seat at 2am in the cold! Outer Preparation: Hot food and Drinks:Warm food and feasting are a necessary part of a Winter Solstice vigil, in the tradition of so many millennia of feasting and celebration around this time of year. I have a smallish iron cauldron to hang over the fire and a 12 quart dutch oven for the fire that I will be bringing to our ceremony to keep the hot liquids and foods flowing all evening for participants. Warm drinks of the alcoholic and non-alcoholic variety are necessary for a vigil. I don’t drink, I prefer warming herbal teas or cider mulled with cinnamon, nutmeg, cloves, and orange peels. Outer Preparation: First Aid. Its not a bad idea to have some general first aid materials available, especially if you are going to be doing your Winter Solstice vigil somewhere far away from civilization. Preferably, also it is a good idea to have someone along who knows how to administer basic first aid. Outer Preparation: Seating. If you are using a chair sitting up, you will need to somehow wrap or protect your body against the chilly air from behind. Sitting on blankets or wrapping yourself in a sleeping bag can work well for this, especially for the back parts of you away from the fire. I prefer to sit on the ground, but that presents its own unique challenges as the ground obviously gets frozen and really cold this time of year. To sit on the ground for a period of hours successfully requires you to protect from cold and damp. I use a tarp as my base layer to protect from the damp. Then, I usually start with a sheep skin (which I have used for many ceremonies) and a few layers of blankets on top. Inner/Outer Preparation: A Yule Log: The Yule Log tradition has many variations, but I like to use one for the Winter Solstice Fire Vigil. A Yule log should ideally come from someone’s property or be found, never bought. It is usually a tree or part of a tree, like a large stump. The large stump will burn through the night, and that’s part of the tradition. Usually, the log is somehow specially prepared and magically prepared; one older tradition has it wrapped in evergreen and doused in cider. In my grove events, we’ve painted it with natural dyes, wood burned the log, added springs of cedar, and have done many other things to honor the log before it is added to the Winter Solstice fire. The ashes of this log, and fire, are distributed to participants and are excellent for land blessings and tree planting ceremonies, among other things. Inner Preparation: The Mindset: In advance, it is a good idea to set some mental limits to the event and understand when you shouldn’t or should end the vigil: if you can’t feel your fingers and toes, maybe its time to end the vigil. If you fall asleep, is that ok? What about if everyone else wants to go home and off to sleep? Give some thought to what you will or will not do, given certain circumstances, in advance, to help your preparation. Inner Preparation: Facing the Darkness. The other part of this ceremony, as with fasting and many other kinds of initiatory work, is that you really do push your body and spirits in ways to its limits. Physically, the body may not be used to staying up all night, nor used to being in the cold for so long, or sitting by the fire for that many hours. Understanding, going into this, that this is a sacred ceremony is important. Also, you will be in the darkness for a long time. You may, deep in the night, have to face your own darkness. The darkness is darkest, and scariest, just before dawn. 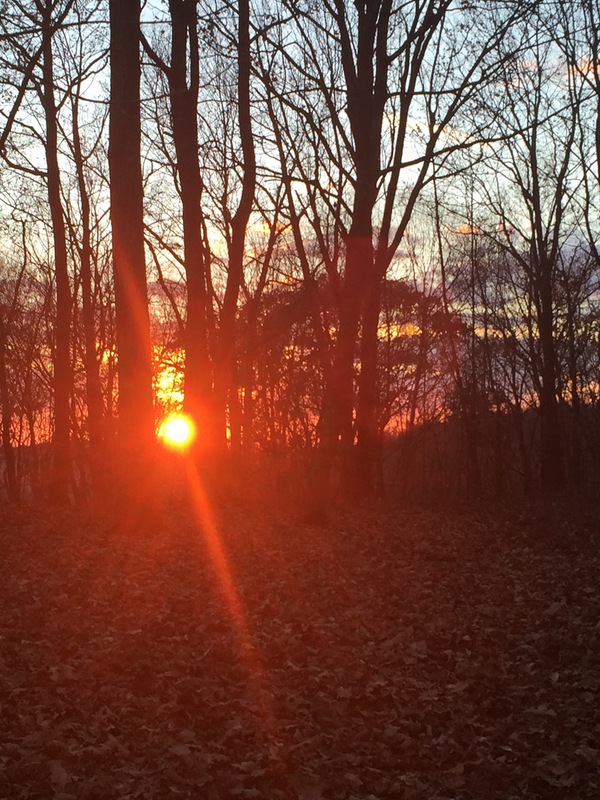 I will never forget the end of a vigil evening I spent in the woods by myself–I had never been so happy to see the sun rise, and I was so proud that I stuck it out till that moment. My own preparation for this kind of deep work involves sitting in darkness for some time for 30 min or so in the days leading up to the ceremony and doing other things to embrace the darkness this time of the year (you might look at my post from last Winter Solstice on embracing the darkness for many suggestions). So if you are still reading, then we are ready for the Solstice eve to come and for the ceremony to begin! I have found that the vigil evening is essentially composed of three pieces: the vigil opening ceremony (which may be attended by more folks than those who are doing the all night vigil), the vigil itself, which involves feasting, merriment, as well as quiet times, and the vigil closing ceremony, which honors the rising sun. I’ll take these each in turn, starting with the opening ceremony. We will do our vigil opening ceremony just as the sun is setting, which for us, is about 5pm on the night of the Solstice. Because we will have a larger group for this and for the first part of the vigil, but only some staying for the entire vigil, we keep this in mind as part of the ceremony. Note that we do not yet have our fire lit at the beginning of the ceremony (it is lit during the ceremony itself); this is so that we can spend some time in the darkness and the setting sun. Opening up a sacred space: As the darkness settles, we open a sacred space. In the druid tradition, this includes proclaiming the intent of the ceremony, declaring peace in the quarters, cleansing the space with the elements, making an offering to the spirits of the land, and casting the circle around the entire space where we will be. We will begin by speaking of the Winter Solstice and, the history of how humans have celebrated this time with light and fire, and of the darkness and wheel of the year. We will all sit for a time in meditation, in the growing darkness, honoring silently the setting sun and preparing for the vigil of the evening. We will light our fire, honoring the light of this season and welcoming the sun to return after his long sleep. Once the fire is going, we ceremoniously add the yule log. In the spirit of the AODA tradition, we invoke the three currents (solar, telluric, and lunar) radiating a blessing out to the land. We begin the vigil, which starts with a feast and merriment. It is sometimes the case that folks will want to join you for the opening (or for sunset and sunrise) but do not want to join you for the entire vigil for any number of reasons. These choices should be honored. Those who wish to stay will stay, and still, be supported by those who will not stay for the whole night. There should never be any pressure to stay, or not to stay, during such an intensive ceremony. A magical space (circle) should be prepared in such a way as people can pass in and out of it with ease, if this is to be the case. This will certainly be the case for our group this upcoming week. In my experience, there are really two ways you can go about your vigil: the time-honored tradition of fesating and merriment, using food, song, dance, and celebration to push back the cold and dark. The second is a time for powerful initiation into the deeper mysteries of the winter months, the darkness, and the time of cold and rest. I have found that both of these often happen in the same night during a winter solstice vigil. At some point, the feasting and merriment subsides and the darkness sets in, visions and waking dreams begin. Both are useful and powerful, and like the ebb and flow of the tide, both often happen in the course of the ewvening. Recognizing this, and honoring this, is part of the process. Ritual feast: Holding a feast as part of the ritual is a wonderful way to keep everyone warm and happy. Ask folks to bring food that can either be heated up or that is kept warm. Our site doesn’t have electricity, so people will use blankets and such to keep food warm. Eisteddfod festival: Holding a bardic Eisteddfod is a wonderful way to pass some of the night. The Eisteddfod includes any of the bardic arts: storytelling, music, dancing, and song. People take turns and, if you have enough people, a bardic competition can also take place. Sharing your Life Story: Because you have 14+ hours, you have an opportunity for the deepest kinds of meaningful conversations with others around the fire. During my successful past vigil, one of the ways we managed the time was having each of us take an hour or so to tell the important parts of our life stories, the things that shaped us as human beings and put us on our spiritual paths. 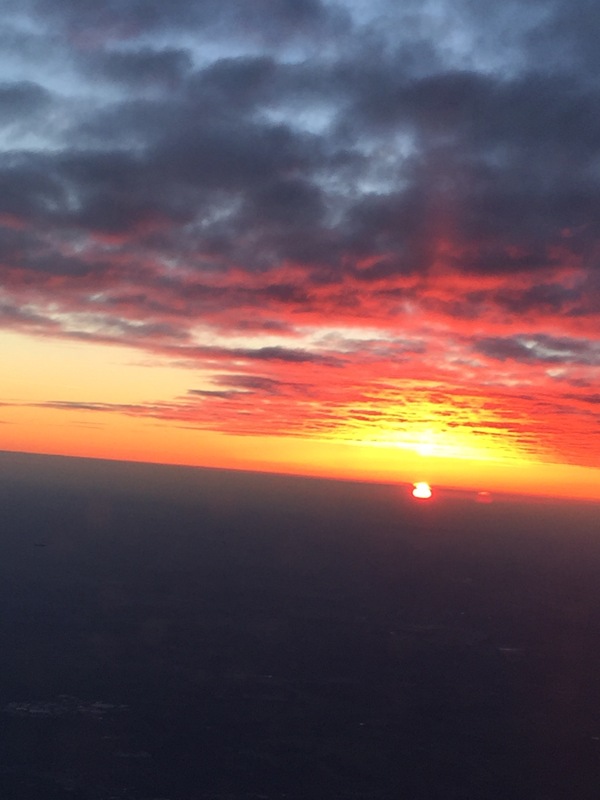 As the sun rose, after hearing the stories of everyone around the fire, and sharing my own story, I felt an extremely close connection to those. Darkness walks. One of the other things I really like to do, especially if there is some moonlight, is to take a break from the fire and to simply walk the land, seeing what things look like in the darkness, and feeling its power fully. Sleeping area. The alternative to flat out leaving the area is to have a “sleeping area” (for us, a hayloft with warm sleeping bags) for those who need a few hours of sleep. One variant on the vigil tradition is that its more like a watch: as long as someone is holding the space and tending the fire, that practice can be rotated. So some people may go off to sleep for a few hours and then spell off others. This is another good way to get through the evening and the vigil becomes a group effort. After the longest night, it is a blessing beyond all blessings to see the light rising again into the world. There are so many ways to welcome back the sun, and I will share a few of those here. A Norse tradition that I rather like for welcoming back the sun is ringing bells right as the sun rises over the hills/land. They ring clearly and brightly, welcoming the sun back. Letting the fire burn down as the sun rises–the fire was holding space for the sun, and as the sun rises, letting the sun regain that fire is a good way of ending the ceremony. Silent observation, observing the ever-changing landscape as the sun returns. Once the sun is up, you can then do any other ceremonial work. Honoring the sun with singing, dancing, and merriment – if you have anything left in you, this is also a wonderful idea. Making offerings to the sun and to bless the land. I have bottles of dandelion wine that I made for several years and like to offer the sun, the giver of life, some of this wine. Now, you don’t have to do the whole vigil to wake up and honor the sun. There is nothing that says you can’t do the ritual at night, still get a decent night sleep, and then wake up before the sun to welcome it back to the land. So these can work regardless of whether or not you are doing the vigil. Once you’ve honored the sun and observed its rising, you can thank the elements and close the sacred space. Likely, then, it is a good idea to go and get some sleep. Many solstice blessings to my readers–and may your dark nights be filled with merriment, inspiration, and joy! Let’s start today’s post with a short exercise. Take a look at your hand–look at the patterns of veins under the surface. What does that remind you of in nature? Now, look at the creases on your fingers, again, looking at the patterns of nature. Turn your hand around and stretch out your fingers, pointing your hand in front of you. What does that remind you of in nature? Next, make a fist and keep your arm pointed out. What pattern in nature does your knuckles remind you of? Finally, turn your fist to face you. Take a look at the spiral there, in your fingers. What this exercise shows is that the outer patterns of nature, the patterns we work with in permaculture that I described in my last post in this series, are literally embodied within us. I only just shared a few of nature’s patterns you can find on the human hand: the pattern of the river or leaf (veins), the pattern of the waves/clouds/sand (creases in hand); the pattern of the river delta or branching tree (hand outstretched with fingers apart); the pattern of the mountain range (knuckles); and the sacred Fibonacci spiral (closed fist). Our bodies replicate so many patterns of nature, as we are, after all, part of nature. But we only need to look to our own bodies to remember this important fact. The landscapes of our inner lives are rich and varied. Moving within, our minds are rich landscapes of thought, experience, wisdom; conscious and unconscious realms; these realms allow us access not only to our selves in this life, but our higher selves. Some of us don’t like to go within our inner worlds, for the fear of darkness or pain we might find there. As we grow older, time creeps up, and more experiences pile on us–things we don’t want or didn’t ask for enter that can weigh us down. But as the ancients understood, and certainly as many magical traditions today explore, the rich landscape of the inner realms knows no bounds and has no limitations–only those we place upon ourselves. It is another landscape, the landscape of our inner lives, and one that very directly reflects outer landscape–the inner and outer worlds are reflections of each other, two parts to the whole. And so, the inner landscape, the landscape of our immediate souls and inner worlds, is well worth considering through the permaculture design principles. Our bodies, and our lives, are a different of landscape from the external one that a permaculture designer would typically explore, but the principles can apply all the same. Today’s post explores some tools for working with our inner landscapes and the possibility of permaculture as a framework for some of the inner work that we can do there. (If you haven’t read my post on design principles, you might want to start there and then return to this one). On the inner landscape, the principle of spirit and the magic of the bee asks us to do the work of transformation. We do not live in perfect bubbles of happiness where everything always goes as planned, and one of the key ways to stay healthy and happy is by learning to transform negative experiences and inner states into growth and healing. Observe, Interact, and Intuit. On the inner landscape, this first principle is critically important. We don’t spend much, if any time, stepping back to fully observe our own patterns, behaviors, thoughts, and feelings because we are typically up close and living those experiences. Stepping back and simply understanding those patterns is key. I want to clarify here the difference between observation and evaluation (evaluation is covered under “reflect and revise” below). Observation here is simply the act of non-judgmental understanding and acknowledgement. There are many ways to do this, including druid retreat, meditation, deep and open listening of loved ones who know you well, stepping back in an intense moment to re-see a situation, or keeping a journal of our thoughts and feelings (which can help us understand patterns in our lives). Any of these are all observation techniques that can begin to better understand ourselves and our own patterns. Once we have a sense of our own patterns, conscious, subconscious, and unconscious, we are better in a position to do inner landscape work and healing. Reflect and Revise. Stemming from the first principle, the ability to critically reflect on our experiences and patterns and “revise” is tremendously helpful as it facilitates our own transformation, growth, and healing. This is where evaluation comes into play. It might be that we need to re-see painful or difficult experiences in our past and work to transform them. There are lots of ways of doing this, depending on the nature of a painful experience. For example, I find it helpful is to revisit an old would and explore what good has come of it (for example, I have experienced a number of traumas in my life, and it has really helped me to heal by recognizing the harm/wrong that was done, but also how I was able to transform it and use it to help others in my own life). Reflection and revision also asks us to look at where we, perhaps, wronged others or wronged ourselves and allows us to think about how we can grow to ensure that never happens again. Revision allows us to move forward with the promise of change for the future. Meditation on these issues is one of the primary tools I use for this work, although I also use the visual arts (and art journaling for healing) when I feel led. Work on Multiple Levels. Inner landscape work, like all work, works on multiple levels within our lives. One such level is the relationship between our inner worlds and outer realities: how we manifest inner hurts or joy as our outer realities; also, how inputs from the outer realms become our inner states (see my discussion on waste for one example of this). A second way to consider this principle from an “inner landscape” perspective is that of the conscious, subconscious, and unconscious (which I consider a connection to the higher self). When we are pained, we are often not only pained consciously, but that pain works deeply within us, causing us to behave in ways that we aren’t always conscious of. Sometimes, we have to work on things consciously for a time, to do some deep inner healing work. And then our subconscious and unconscious take over, facilitating healing at those multiple levels. Yet another way to think about this principle is the connections between the mind, body, heart, and spirit–understanding that all of these levels need our attention. This principle asks us to understand that we are multiple-leveled individuals, with multiple kinds of levels, and these levels always present. We can maximize our own growth by attending to them and working with them through healing, reflection, and ritual work. The air principles on the inner landscape ask us to use our knowledge and logic to work through inner problems before us. The hawk flies high, and it allows us to gain a new perspective through the application of wisdom. The Problem is the Solution. Sometimes, limitations in our thinking prevent us from moving forward. We become stubborn, using words like “can’t” or “impossible.” Some people are defeated before they begin. They go to face a problem believing they will already fail, and they haven’t taken the time to find the solutions through the problems they face. That, in itself, is a magical act that disempowers them! Or people use words like “I can never change” or “these problems are too big” or “this is how I live” accepting the situation and feeling defeated. We don’t just hear these on the outer landscape, but we also apply these ways of thinking to our inner worlds. This is self-defeating talk, and with this talk, the problems really are insurmountable–but they need not be. There is always way forward, and this principle asks us to turn the problem on its head, look for the solution within that problem, and use this as an opportunity rather than a hurdle. I like to use discursive meditation to work through problems of this nature and see the various perspectives. Mushroom Eyes. One of the unfortunate cultural sicknesses we have at present is what herbalist David Winston calls a “hardening of the mind.” The mind, like the heart, can harden to the point where we become so set in our ways that we can’t see beyond it. We close down, we refuse to see anything other than what we want to see (and for evidence of any of this, I point to the US election at present). Mushroom eyes asks us to get beyond hardening of the mind by applying multiple lenses and many approaches with which to see the world. This can mean working to see something from someone else’s point of view, or someone else’s set of experiences. Or to see something with our own lenses removed. It asks us to cultivate an openness and wisdom to see into the heart of issues within and without. This reseeing, through new perspectives, helps guide our inner growth with wisdom and grace. A second way of considering the principle of mushroom eyes for inner work is through the importance of the ternary and ternary thinking within the druid tradition. Western civilization loves binary thinking and often, issues are framed as having only two “sides” when the reality is that three, four, or even dozens of different perspectives may occur. I try to cultivate this practice in my own life by talking to those of diverse perspectives about their experiences, practicing deep listening, and really trying to put myself in other people’s shoes. Speaking to those of different cultural backgrounds and experiences, and even visiting other cultures and places can really help us develop inner mushroom eyes! Design from the Patterns to Details. 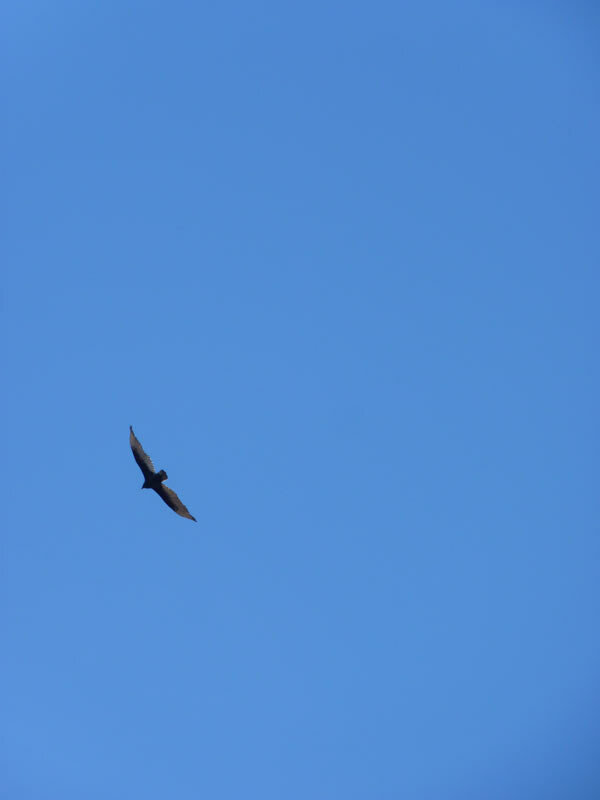 The hawk flying high asks us to consider our overall goals and patterns, and to use those overall goals and patterns to enact change on a daily or even minute-by-minute detail. Its not enough to say “I want to change” but rather, we need to set the broad goals that can help us work down to the specifics. Articulating our overall goals, and time frames for those goals, in big terms; seeing how they can weave into the existing patterns of our lives, and then creating a long-term plan are all simple ways to develop inner landscape designs. There are lots of ways to do this: I like vision boarding, which allows my subconsious and spirit to speak, rather than using my concious mind. Second, I like setting personal goals for myself–not just what I want to accomplish, but what I want to cultivate (like good listening skills, joy in my life, less tangible things). Setting goals, even for our own inner transformation can help fuel our growth. For example, if I wanted to work on my own sensitivity to others, I might set that as my larger goal and then set weekly goals of self-monitoring when I am easily upset or offended. I check in on the progress of my yearly goals during the eight holidays of the year–and set new “yearly” goals for my own growth and development at each winter solstice. Fire is the embodiment of energy and change; it is the fuel through which we enact transformations on our inner landscapes. The stag in the heat of the chase facilitates our own healing and growth. Catch and Store Energy (Holmgren). On the inner landscape, we should pay attention to our own energy flows and find out how to best harness them–for being masters of our own energy is one way to help us grow. Ultimately, how much energy we have on a daily basis determines everything in our lives: if we can pursue and adapt to our creative gifts, if we are able to meet our goals, how we balance our life and work, how we balance other demands–attending to our energy, and harnessing it for the things we really want to manifest, is key. There are many, many, aspects to this, so I’ll share a few here. First, we need to find out when we can best express our creative gifts or have the right energy to accomplish what we set to accomplish (for example, I like to write creatively during sunrise, and I drafted this post as the sun was peeking through the mountains!). Second, we can also explore ways of balancing our own energy and cultivating the positive aspects of energy in our lives (for this I like the daily protective working of AODA’s Sphere of Protection and OBOD’s light body exercise). Third, I’ve talked at points on this blog about the outer practice of using herbs for healing and support; they can be allies in helping us catch, store, and replenish our own energy. Finally, and most importantly, we need to see how our resources–especially our physical energy–is being replenished. If we are constantly drained and overworked, we are not catching and storing energy for our own growth and work that is most important to us. We need to evaluate our personal lives, work lives, and family lives to see how our energy is being used, and make sure it is in line with our goals (see above, “Design from the patterns to the details.”) A really interesting perspective on life energy and work is found in a book called Your Money or Your Life–it will totally change your relationship with your work! Spiraling Changes (Use small, slow solutions, Holmgren): Spiraling changes also asks us to attend to our energy, but in a different way. This principle suggests that when we make change, we need to make it in a way that is both slow and spiraling; these changes in our inner landscapes are more effective than rash quick ones that can’t be maintained. This principle is about learning to sustain our own energy to in our inner landscapes and our own healing and growth over the long term. 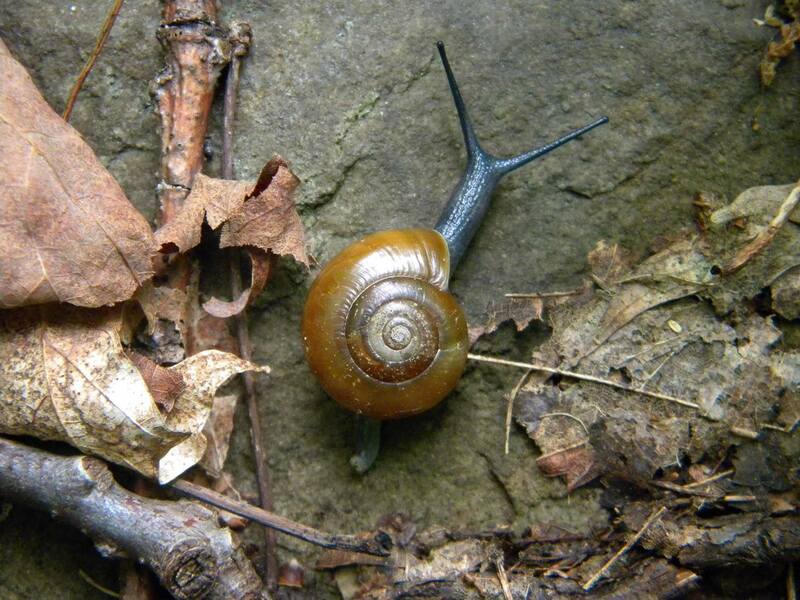 Spiritual development and inner work on ourselves is a long-term project; think of it like a snail shell where we are every growing, and yet, coming back around to visit things again and again from a deeper perspective. Keeping momentum going, but momentum you can reasonably sustain, is key here. I’d also mention here the use of small daily reminders and rituals that can keep you on the path of positive change: a five minute daily ritual, even, can offer tremendous growth in your life in the long run. Creatively use and respond to change (Holmgren). When I was in North Dakota some years ago, I went on a trail ride near the Teddy Roosevelt National Park. The horses had walked this same trail so many times, that at points, the trail was at points 5 or six feet deep and quite dusty–we were literally walking in a deep rut in the desert, made by those horses feet over a period of decades. This, to me, is a physical representation of a deeper truth: how we can get stuck in the neural pathways of our own thoughts the more we engage in those thoughts. Change is a constant reminder that we either have to learn to adapt or be like those horses, only seeing the rut that we have inhabited for so long. That we are going to encounter difficulty and that things are going to change is inevitable–how we approach and use that change in our own lives determines so much of not only the immediate outcome, but the long-term growth we are able to have. A key part of this work recognizing change as an opportunity for growth. A good book on this subject is Carol Dweck’s Mindsets. She describes two mindsets that people can have: growth (where change/challenge is viewed by an individual as an opportunity for growth) and fixed (where change/challenge is viewed by an individual as something to be defensive against). Its more complicated than that, of course, but these two mindsets surrounding change and challenge really do have tremendous long-term implications for our own growth and development. Seeing change in a positive light and looking for the good and opportunities even in challenging situations can seriously facilitate our own growth as human beings long term. The Salmon and the element of water focus on interconnections and relationships—this is certainly true of our inner landscapes as much as our outer ones. Integrate rather than Segregate (Holmgren). There are certainly many ways to take integrate rather than segregate. The one I’ll focus on here, however, is one that plagues so many of those in the druid community: the desire to live a whole, authentic, and unified self. So many of us find ourselves in unsupportive environments where we don’t feel we can be unified, and so, we live fragmented lives. We are “druids” in our houses or forests, and “professionals” in our workplaces and “parents” or “children” in our families…and this fragmentation grates on our souls. It takes facing your fears, cultivating the ground slowly, and really considering all aspects, for us to work to integrate our spiritual lives with our physical reality. Part of this means, of course, is finding ways of being open about who we are that allow us to navigate those tricky boundaries; a second part of this means living our principles and living in honor with the land through regenerative and sustainable living practices. 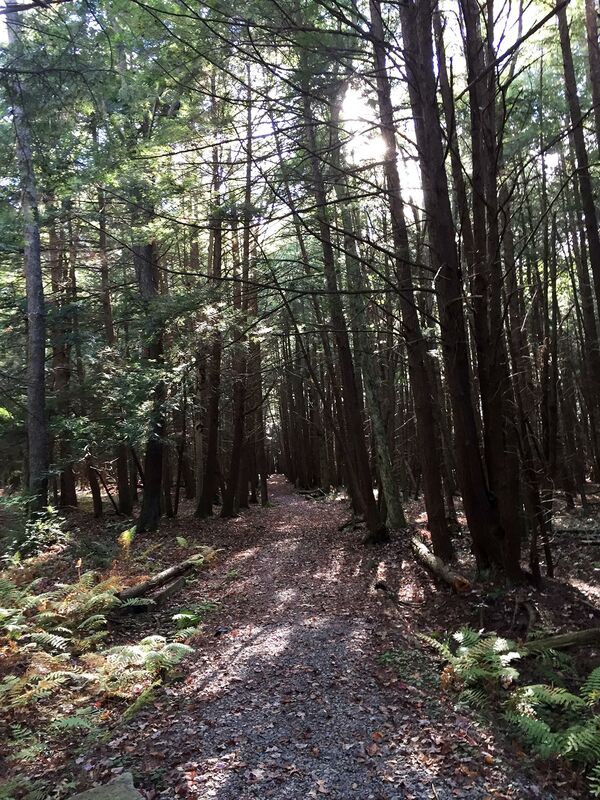 A third part might involve conversations with loved ones about our paths. This work is certainly not easy, but it is worth working towards: the integration and fullness of living who you truly are. I’ll be working on a post just on this topic in the near future! Layered Purposes (Each element performs many functions, Mollison). Layered purposes suggests, on the inner landscape, that many of the things we do can have more than one purpose. One of the challenges I put before me, for any inner work, is to see if I can find more than one take away or outcome from it: perhaps meditation gives me peace of mind, helps me work through a difficult problem, and reconnects me with nature. Seeing the purpose, and the multiple purposes, of our daily spiritual practices are certainly useful! Use the Edges and Value the Margins (Holmgren). When I was taking my permaculture teacher training course this past summer, Lisa DiPiano shared the idea of “pushing your edges.” Each of us has an edge space–this is the space where we move from comfort to discomfort, the space where we don’t quite feel as at home, or the space where we are really in new territory. Perhaps for our inner landscapes, these are the edges between two parts of ourselves (the “professional” and the “druid”), or the spaces between the “light” and the “darkness” within us, or the other places where we feel less comfortable. It is important to safely explore those edge spaces, as those are the spaces of the most change and growth. Lisa suggetsed that we all bush just beyond our comfort zone–not so far as to get overwhelmed, but just far enough to know we are experiencing the discomfort that comes from learning and growing. You might think about the edge space like the rings of a tree: a tree grows each year, its bark expanding and another layer of life being added. Each time we push our edges, we are like the rings of that tree, growing stronger and more steady the more we are able to engage those edges and integrate those experiences. The element of the earth and the great bear focus on the material aspects of our lves; for the inner landscape, we focus on the outcomes and resources that we have. Obtain a Yield (Holmgren). This might seem on the surface like a principle that wouldn’t fit in inner landscape work, but truly, it is one of the most important. The “fruits” of our efforts–of spiritual practice, of going into nature, of daily meditation, of inner healing work–can be difficult to measure and take stock in because the “yields” are less tangible–but not less real. I think its important to consider our yields in our own lives: what do we cultivate and bring forth? Happiness? Peace? Creative gifts? Nurturing of others? Calmness of spirit and mind? One of the ways I like to recognize the fruits of my efforts is to keep regular spiritual journals (a practice I started over a decade ago in my AODA work). Then, usually at the Spring Equinox, which was the time when I began the druid path, I take time to review one or more of those journals, and to consider my journey ahead. It is a tremendously useful practice which allows me to see just how far I’ve come and recognize the yields that I’ve gained. And, just as I discussed in the outer principle in my previous post, we need to expand our idea of “yield” to think about the many yields we can have: clarity, peace of mind, joy, creative projects, self expression, depth and understanding, better relationships with loved ones, and more. Waste is a resource (Mollison): As I’ve written about in past blog posts, we have a lot of waste in our culture, in both our outer lives and in our inner realms. On the inner realms this often includes the wasting of our own time and energy on things that do not help us grow. I can (and have) written a lot on this subject in the past, so I’ll be brief here. Monitoring our own wasted time (for most, especially with electronic devices) and turning that waste into a resource that we can use is a really important part of our inner landscape work and growth. This is not something you do once but rather is a continual process of self monitoring and adjusting. Limiting time on social media, removing television from our lives, all of these things can help us get back in tune with ourselves and turn waste into a productive resource. Embrace Renewables (Use and value renewables, Holmgren): On the inner landscape, we might think about those things in our lives that renew and replenish (and that renew and replenish us) vs. those things that drain us (temporarily or permanently) and work to embrace renewing activities. This might mean that we spend time with certain people or we work to bring in certain activities that we enjoy and that bring us energy and peace. 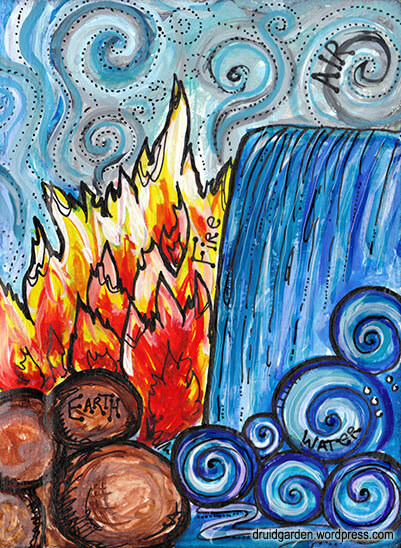 We don’t want any “fossil fuels” in our inner landscapes, burning out and polluting the place! I think the practice of self-care fits here; it is critically important in our own inner and outer work. If we are not engaging in renewing activities, we will never be able to have enough energy for the inner transformations and healing that we seek. I want to conclude this post by offering a key suggestion for enacting many of the principles above: meditation. Meditation is a practice that can–literally–open up our inner worlds before us. There are many, many, different practices of meditation, many with different goals. Most of the meditation I do on inner landscape work is either discursive in nature (a type of focused thought) or inner journeying work. I find the more culturally dominant “empty mind” meditation or “mindfulness” meditation good for cultivating peace and tranquility, but not good for actually helping me work through various things on the inner landscape. Now, I need peace in my life and I need to learn to quiet my mind–and these empty mind kind of meditations are really good for that. But a lot of the work involved in the principles above are about directing your thinking and feeling in particular ways–and this is where I believe discursive meditation really shines. So if you are going to take up the practice of meditation, understand that there are many different kinds of meditation and that these practices often accomplish very different goals. One meditation style may not yield everything that you need; it is better to have a few different styles available to you for different purposes. Before you can benefit from any of the deeper aspects of meditation, the first step is establishing a regular baseline practice of breathwork and calming the mind. Some good preliminaries are found here. For those seeking to establish such a daily meditation practice, I would recommend John Michael Greer’s Druidry Handbook or Druid Magic Handbook for more information. The techniques which JMG teaches, including color breathing and the four-fold breath (breathing in for four breaths, pausing for four breaths, breathing out for four breaths, pausing for four breaths) are great introductory ways to open the door of the mind to deeper transformation. Once you’ve established a good practice, you can do some of the more advanced inner landscape work. I hope that you enjoyed this post–I would love feedback on the concept. (As those familiar with permaculture would note that I am certainly pushing this series, and this post in particular, well beyond the typical uses of permaculture design principles). Blessings! Humans throughout history have looked to nature as the ultimate teacher; nature is the sacred text from which all wisdom flows. As druids, we know the more time you spend in nature, the more you align with its rhythms, and the more you discover its many teachings. One of the reasons I am so committed to permaculture design as part of my outer druid practice, is that permaculture design is rooted in that same natural wisdom. The permaculture design principles, which I’ll be discussing today in this post, are the core of permaculture: we use them, along with the three ethics, to help us make every decision, not only for design work, but also for daily living. 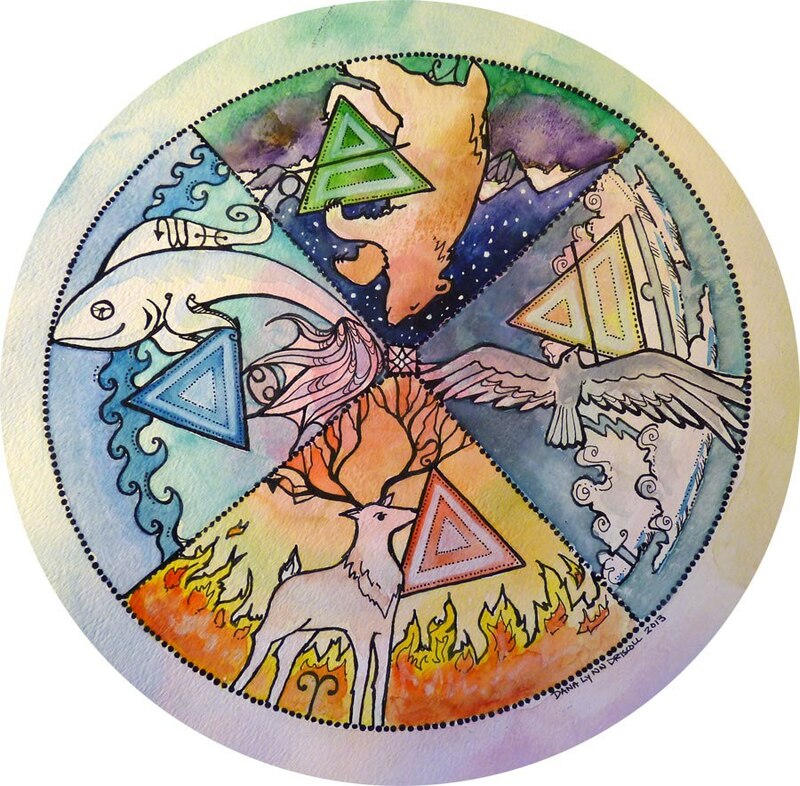 If we are going to continue our journey into the inner and outer realms of permaculture, and how this concept ties to druidry and other earth-based spiritual practices, a discussion of the design principles is our logical next step! I’ll be drawing my principles from three sources: Holmgren’s (2002) Permaculture: Principles and Pathways beyond Sustainability, Mollison’s Permaculture One, as well as from my Kay Cafasso’s Sowing Solutions Permaculture Design Certificate course. I’ve also found it useful to group the principles under one banner of the elements and the druid animals (with my own addition of the bee of inspiration for spirit). The principles don’t all work in the same way, and this grouping helps us understand them in a new light. In terms of the actual principles, in some cases, I have kept the principles the same. But in other cases, I have adapted these principles to be shared and most applicable to those following nature-based, earth-centered paths. This meant that I may given them a more appropriate name that will better resonate with our values, and in other cases, I have created new principles that are rooted in the spiritual traditions in honoring the living earth. I want to note that my lens is by no way present in mainstream permaculture, although certainly can be found on the fringes of the current movement and, I believe, is being woven more and more into permaculture as a practice. As people regenerate and heal the land, they are naturally drawn to it spiritually. As a druid, know that these principles go much deeper. I’ve also included the original design principle in parenthesis when necessary. The principles of spirit, through the magic of the bee, ask us to observe what is around us, to rethink and resee those experiences, and to understand the connections to all things. Bees are master alchemists; they transform nectar into honey that can stay preserved for 1000 years. Bees embody the principle of transformation, teaching us that we, too, can work our magic upon our earth, especially if we work collectively. Observe, Interact, and Intuit (Observe and Interact, Holmgren). This principle is simple—it asks you, before you do anything else, to spend time observing your surroundings, interacting with them in a non-judgmental way, and (and this is my addition) using your intuition to guide you. We can gain incredible insight from this simple activity, and using the information before us is a way into all else. All living beings use this same principle: observing, interacting, and working on instinct to survive and thrive. We do this in the AODA, where members are asked to spend at 15 minutes a week in nature in stillness and focus, for example. Reflect and Revise (Apply self-regulation and value feedback, Holmgren). This principle has two parts, and we’ll briefly consider each. There is tremendous value in when we simply stop what we are doing and carefully think and meditate on our actions—this is the act of reflection. Reflection, through meditation, journaling, and quietude is a cornerstone of nature-based spiritual practices as well as permaculture. Revise, here, suggests that if we spend time periodically really thinking through and reflecting upon what we are doing, new insights may arise that we will be able to employ in our sacred action. Revise here also implies that not being too committed to any particular approach is good—revision is a process where we shape and hone earlier ideas into something better. Sometimes, it takes us working through a project or meaningful change partway before we see a better way we can do something. Work on Multiple Levels (New principle). There are a few ways to think about this principle, derived from both systems theory and hermetic occult philosophy. On the side of systems theory, we need to have an awareness and engage in designs that allow us to consider and work on multiple levels: the micro/individual, and the macro/system. When we recognize that a single element is part of a larger system, that changes the way we think about that system and about that element. Working on multiple levels encourages us to think in these two perspectives at once, and consider the interplay between them. This same interplay also takes place between the inner and outer realms. 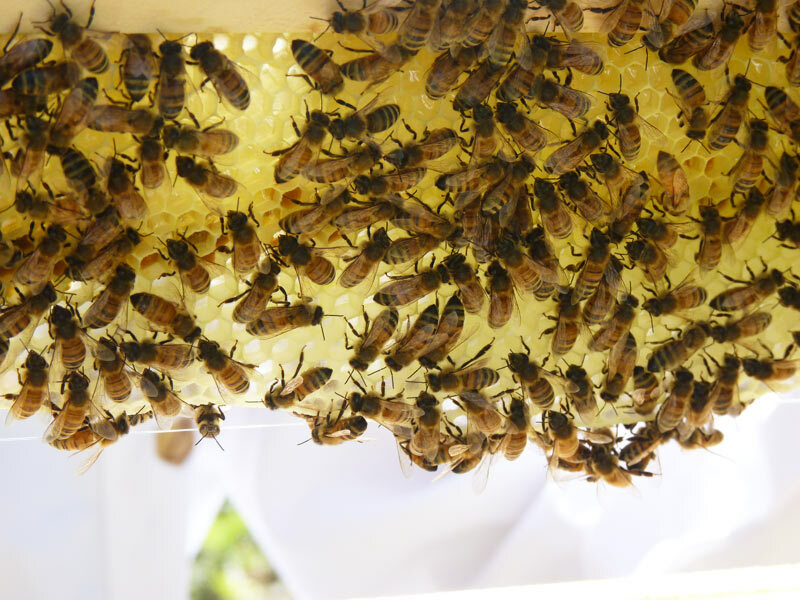 The bee, as both an individual and as a superorganism, helps us better understand this principle: a solitary bee functions on her own, but does so as part of that larger hive (system of bees) working for collective good. On the hermetic side, this practice, is perhaps best epitomized by the magical adage, “As above, so below, as within, so without.” The underling idea here is that what we do on the inner planes (that is, realms of experience beyond the physical), has a direct impact on the physical plane. Similarly, what occurs on the outer planes has an impact on our inner realms. This also applies to us as people—the inner work we do (reflection, meditation, journeying, ritual) impacts our outer living; and vice versa. It is a principle that is well worth including here, as this principle has been enacted by humans, upon the landscape, for millennia. Outer transformations lead to inner transformations, and vice versa. We heal the land, we heal ourselves. The air principles focus on integrating our knowledge and wisdom to see more paths before us and using the power of air through our logic, intellect, and pattern recognition. These principles ask us to embody the energy of the hawk: first to fly high, take stock of what is before us, and offer us new was of experiencing and interacting as we begin the path towards positive change. The Problem is the Solution (Mollison). This is one of my favorite of the principles, and for good reason. We spend so much of our lives hearing about the problems that plague us and feeling unable to address any of them. This principle turns that powerlessness on its head and suggests that the solution to any problem lies within the nature of the problem itself. For example, lawns are contributing substantially to climate change and the loss of ecological diversity; and the solution is there before us: change the nature of the lawn. It is often than when we look at problems not as insurmountable obstacles, but as opportunities, we can do a tremendous amount of good. Mushroom Eyes (New Principle). This principle is one I first learned as a wild food forager and mushroom hunter. Before we can act, we must see and in order to see we must understand. Observation and interaction is part of this, but mushroom eyes How we see the world is how we inhabit it and how we interact with it. You might think of this is seeing through different lenses–when you put the lenses on, everything is colored by that experience. But these are lenses of knowledge and wisdom. Think about the hawk here—he knows exactly what he is going for. Nature wisdom is about not only awareness but knowledge. Animals teach their young skills necessary to survive; and humans, part of nature, used to teach these same natural lessons to their own offspring. So there is a knowledge component that is necessary for us to do design, and mushroom eyes helps us be able to see in deeper ways. Design from the Patterns to Details (Mollison). Sometimes, when we are working to solve a problem, we focus on a specific thing we want to do (e.g. I want to build a waterfall) without thinking about the overall patterns (in this case, is there an existing resource flow? What is the overall pattern in the landscape?). Often, designing this way leads to trouble because you have the specific elements you want but you are missing the larger goals and purpose. This principle asks us to start with the biggest picture, like the outer edge of a spiral, and slowly work our way into the details of the problem. We think about the patterns of nature and energy first, and then work or way down to the specifics of that design. We design with the goals first and work our way down to the specific details of how we enact those goals. By starting with the larger patterns that nature provides, we can more effectively design–and attend–to the small stuff. 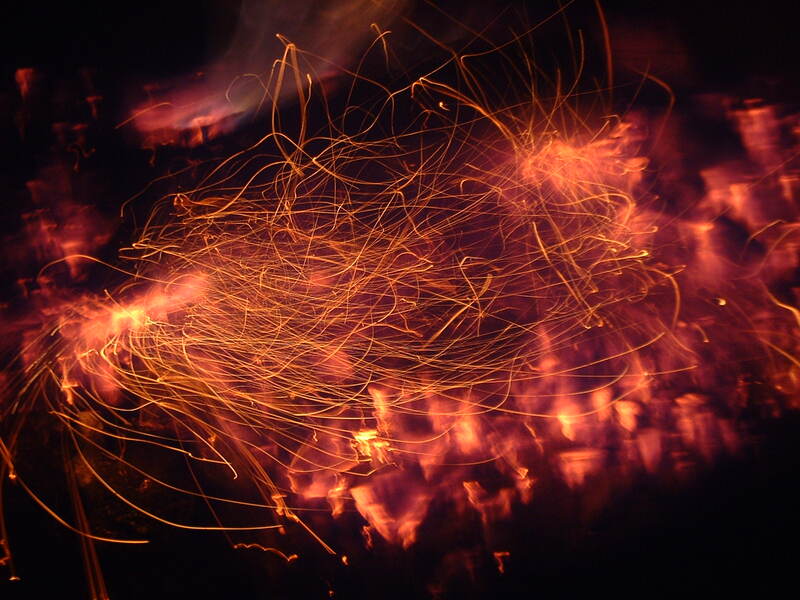 Fire is about energy and change, and these three principles embody what we can do with energy and the many shifting changes around us. The Great White Stag is present in these principles as he lords over the forest: change is a constant in our great earth, and it is the many cycles such as the path of the sun, that we can harness for better life and living. Catch and Store Energy (Holmgren). We live in a time of tremendous expenditure and waste of energy–this principle suggests that we catch and store that energy instead. If we look at a forest as our example, we see that forests are exceedingly effective at harnessing and storing any energy available: the trees grow in fractal patterns to store solar energy, and that solar energy is used over and over again, cycling through the system. In our own lives and designs, catching and storing energy to put to productive use is a key principle. This energy is any resource: external resources like sun, wind, or water and inner resources like time, joy, or passion. We can harness that energy and store it, later to be used. Humans currently have an unbalanced relationship with energy, and it is cause devastation throughout our lands. This principle, then, asks us to be mindful and think about existing energy flows and how they can be most effectively used. Spiraling Changes (Use small, slow solutions, Holmgren): You might think about your own path as that of spiraling slowly up a mountain. You don’t climb a mountain all at once and you certainly don’t do it without preparation, ongoing evaluation, and occasional breaks. When we enact spiraling changes, we focus on what is managable for us in that moment and how to build momentum over time. Because, in reality, it are the small things, done over a period of time, that leave the most lasting impact.Rather than starting big and going all out with a 3 acre design, we create small, slow solutions that allow us to build upon success slowly from within. The principle of the spiral is critical here. We can’t burn ourselves out with trying to do too much, too quickly, and we can’t maintain our momentum. This principle also asks us to consider, for example, the role of ecological succession: we like to create designs thinking 100 years in the future, not just the immediate goals of tomorrow. Creatively use and respond to change (Holmgren). Change happens whether or not we want it to; the world is always moving. Rather than see change as a bad thing, in permaculture we anticipate and embrace changes as a way to open up new possibilities and growth. This closely ties to one of the air principles, “the problem is the solution.” We often see change as a negative thing–we like how things are going, we don’t want things to be different. But change brings opportunity, if only we can see it. Here’s an example: I try putting up an arbor and my plants are so abundant that the thing collapses without adequate support. A creative response to this is to cut the vines back, use the cuttings for wreaths, and build a better arbor that allows me to sit under it! The Salmon and the element of water focus on interconnections and relationships—and the three water principles ask us to attend to those connections. In order to be effective as practitioners and designers of permaculture, we have to pay attention to many relationships. 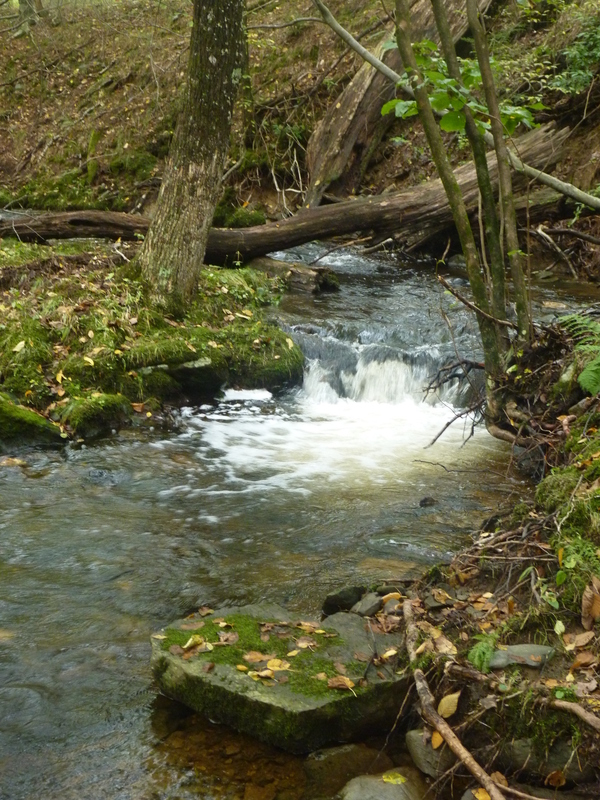 Permaculture, like druidry, is ultimately a path of understanding and facilitating connections and relationships, and the energy of water helps do this very thing. Integrate rather than Segregate (Holmgren). When you look at a typical vegetable garden, you see the veggies all in nice little rows, just waiting to eaten by whatever pest enjoys a good monocrop. Permaculture sees things differently: a healthy forest, after all, is never a monocrop but rather an integrated system. By integrating multiple elements in a design, we allow them to work with each other for good. This principle asks us to consider diversity in our designs; a diverse ecosystem is more diverse and resilient—it can handle pests, disease, and drought much better than a monoculture cornfield. So, too, is a diverse group of people more resilent! This principle asks us to consider how each part in a system is related to each other and to the whole system. This principle suggests that parts work best when they are working together, rather than in isolation. This principle also builds on the spirit principle of working on multiple levels and understanding better how each individual part plays a role. Layered Purposes (Each element performs many functions, Mollison). This principle suggests that each element can serve multiple purposes. For example, meditation works for calming the mind, focused thought, relaxation, and spiritual development (that’s at least four functions, there are others). My chickens produce eggs, create compost from household and garden waste, provide enjoyment and companionship, and reduce problematic insect populations. The more purposes a single element has, the more effective the design. Any single plant or animal species in the forest offers an example: an oak tree provides shade, captures the energy of the sun, prevents erosion, drops leaves to offer habitat, offers nuts, and so many more things. Use the Edges and Value the Margins (Holmgren). 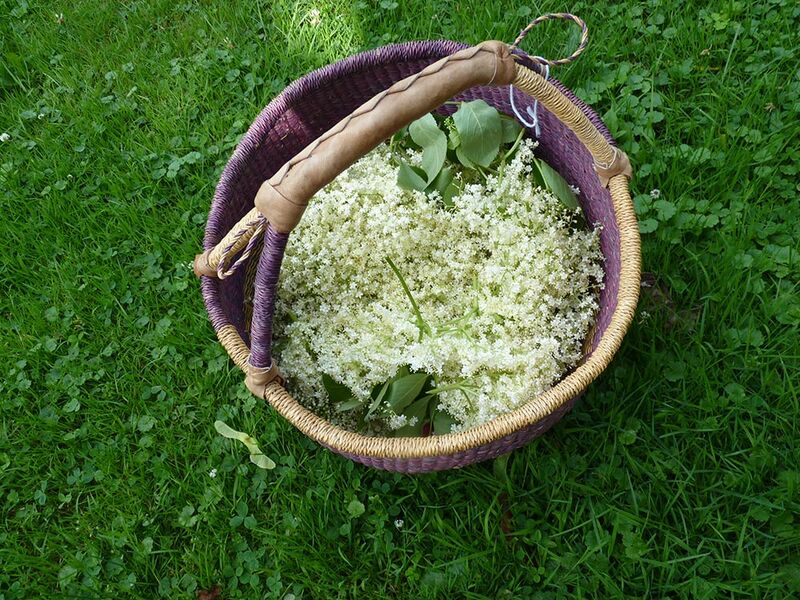 As a wild food forager and herbalist, I know that the margins are always the most abundant and diverse in an ecosystem–that’s where I go for much of my medicine and food. The edge of the pond or forest is where the activity is happening, where the bursting of life is taking place. This same principle can be applied to many other things: it is often at those edge spaces where we find the most interesting things happening! This can be the space between a forest and a field, the edge of your yard or, even, the spaces between two people, the spaces where we overlap. The element of the earth and the great bear focus on the material things: what we do with the resources that we have and how we gain those resources. The earth principles ask us to manage and understand our own resources so that we can live in an earth-centered way. The bear, and his medicine, is often of root, seed, and stone. Obtain a Yield (Holmgren). This basic principle says that we should work to obtain some kind of yield for our efforts. However, in permaculture, the idea of a yield is not limited to that which benefits humans (like a crop of tomatoes). Yields can certainly include food and medicine (the most obvious) but also intangibles like beauty, harmony, and peace. 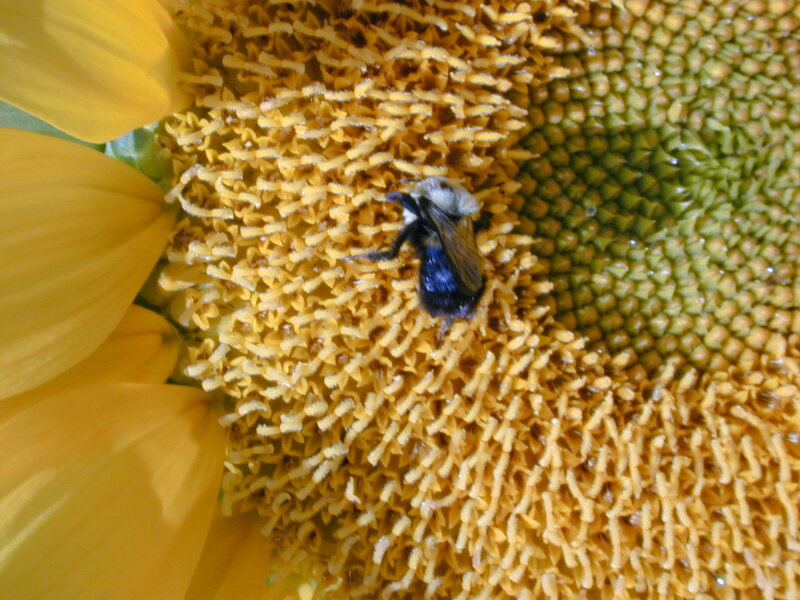 Yields in the natural environment can include blooms for nectar; fruit, seeds, and nuts for wildlife; habitat; soil fertility; erosion prevention, and more. This principle asks us to go beyond our own immediate needs and understand, ultimately, that the abundance of nature is for all to benefit from. Nature is a great provider, and intentional design can help maximize the many yields she offers. This principle also asks us to see a yield beyond that which is immediately physically beneficial to our own lives. Waste is a resource (Mollison): Our culture is drowning in our own waste; I detailed some of the problems we have with waste in earlier posts on waste and humanure. In permaculture, waste (of any kind) is seen as a resource that has not yet been given a proper place. We can work to, as Holmgren says, “produce no waste” by focusing our efforts on redirecting waste streams towards productivity. For example, human waste and urine can safely be used as a fertilizer under certain conditions. Old office paper can be turned into greeting cards using basic papermaking practices. Spent grains from brewing can be added to the compost pile, and so on. Producing no waste goes far beyond recycling and instead encourages us to re-envision our waste streams. Embrace Renewables (Use and value renewables, Holmgren): Stemming from the permaculture ethic of earth care, one of the major issues we have in industrialized culture is an over-dependence on fossil fuels and other non-renewable sources of energy and goods. Our planet has finite resources and the extraction of these resources is causing increasing suffering, destruction, pollution, and habitat loss. In permaculture, we instead embrace things that are renewable or free (like the sun or wind for energy). When we integrate renewables into our designs, we slow and/or eliminate our dependency on fossil fuels. Just as we weave together the elements in rituals and in our own lives, so too, can we weave the different permaculture principles into our daily living. As I discussed in my post last week, these principles aren’t just useful to us as “designers” when we are planning, but they also can be useful to us as mantras for meditation and just as principles for daily living–I try to use the principles as I go about my daily practice. In the past, when I was first learning permaculture, I spent a month intensively studying each of the principles (you could do this for a week or even a day). This meant that for the “problem is the solution” month, I would spend time reflecting on it in meditation and working to embody the principle, seeing where it would work in my daily life, and using it to explore and think through larger societal problems. It has taken me the better part of two years to come to this understanding of permaculture and how it maps onto the druid animals and elemental symbolism. I hope that this framing, along with my new additions and revisions to the principles, are a useful way of understanding these principles and how they can work in your life. In our next post, we’ll explore these same principles from an “inner landscape” perspective and then subsequent posts will move into exploring each individual principle and how we can use it to change our lives, regenerate our lands, and better our world. PS: I especially want to thank David N. for his conversations and feedback on this line of thinking!